Flanked in pink and blue players have high hopes of dreams coming true. Zingo Bingo is destined to put the zing back in your bingo game with a package of tasty treats that are simply irresistible. One of the newest bingo portals to hit cyber space in June of 2012, Zingo Bingo packs a real zinger to your collection of favorites. The homepage is bright and happy and places even the rather crab apple mood into an instant cheerful one. The pink and blue design appeals to both sexes as it draws in an entire bingo community of guys and gals who are looking for a new and exciting bingo. If you are one of the lucky winners count yourself in to be included in the Zingo Bingo Winners Hall of Fame where your name and prize winnings will be proudly displayed. Speaking of proud they wear the 15 Network icon on their homepage signifying they are a member of this up and coming group. They are the third Bingo site to this network with Bingo Vision as the innovative software that is sure to be a crowd pleaser. Zingo Bingo is licensed and regulated by the Alderney Gambling Control Commission. Players can look forward to a refreshing new gaming suite unlike any other they have played before. 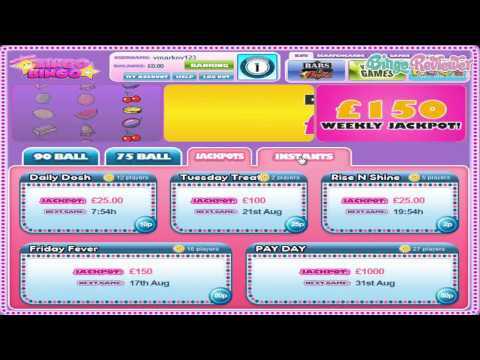 The platform offers two bingo options with 75 ball bingo and 90 ball bingo. Guaranteed Bingo Jackpots are running wild with 2 daily, 2 weekly and 1 monthly offering plenty opportunities to snare a big catch! The live Chat Host will be around to entertain you every day between 7am and Midnight so stay alert for some amazing Chat Games and fabulous prizes. Grab your bingo friends to engage in Team Bingo every Tuesday and Saturday and win the top prize for you and three of your team mates. When you leave the bingo rooms the party never stops with a full gaming suite of Instant Games. Choose from 19 Slots, 4 Scratch Cards, Blackjack, Texas Hold’em, 3 Roulette games, 2 Hi-Lo Games and Keno. The big wheel keeps right on turning when you get to spin it for a guaranteed bonus ranging from £10 - £2,500. This is in addition to your Welcome Bonus on your first deposit. Ongoing Bonuses are available with Reload Bonuses to keep the momentum of extra credits in your players’ account going. New and continual promotions can be found under the Promotions page for weekly and monthly fun. The weekends kick off on the right foot straight away with the Friday Night Takeaway with cash prizes awarded. The Weekend Wad will earn you a share of 250,000 Loyalty Point equivalent to £250. The Loyalty Points scheme is a lucrative program for players to earn valuable points. Collect them every time you wager on your favorite games. 1000 points is converted to £1 real bonus cash. As a newer bingo site and software on the frontier there holds a lot of exciting promise for bingo players looking for unique gaming. The well laid out platform and graphics are a good indication of more good things to come. We rate Zingo Bingo with 4.25 Pink Hearts. I joined Zingo Bingo a couple days after they opened in June. I love to tryout new bingo sites and i have to say this one ran very smooth for a new operation. I deposited £20 and couldn't wait to spin the wheel for extra cash bonus. I won the minimum prize of just £10. I wish it was the max £2,500 but i wont complain because something is better than nothing. I have already made it up to the VIP Bronze level and can't wait for my birthday in October for the free birthday bonus. I don't know how much but will let you know when i get it. I have won a few times playing here and the withdrawal times were fast and hassle free. Bingo with a Zinggg! What a friendly welcoming site this is. Even though fairly new to the world of online Bingo, Zingo Bingo is growing fast and looking good. I always like sites that have good promotions and also feature a Facebook page where you can get quick information and play contests to win free bbs and prizes. Zingo Bingo's facebook page is full of well presented information and is a good place to hear what other players are saying about the site. The free £20 for new players is great as is that spinning wheel to win an extra bonus with your first deposit. Always nice to be welcomed with gifts when you first join a new site and decide to spend your money there. They've made a new year's resolution to spoil their players this year, so it's a good time to be a player at Zingo Bingo. Play and win Love to Shop vouchers in January. Take advantage of the £150 Guaranteed Jackpot game every Friday at 8pm. Tickets are just 50p and you can prebuy in advance. These are just a few reasons Zingo Bingo is a nice site to join. I'm glad to hear that players are winning and withdrawing is easy. Good Luck to all players! You won’t be disappointed when you play at Zingo. From the games, to the promotions, it’s excitement all day long! Promotions are offered on a regular basis; daily, weekly and monthly like free bingo, bargain bingo, and lots more. They have you off and running right from the start. Sign up and you'll get a generous £20 free, plus a free spin on the wheel where you can win up to £2500. It’s a friendly pack of people that make up this site and you’re bound to make a few great friends. That’s one of the reasons their team bingo is so much more fun! They offer traditional bingo varieties here including 75 and 90 ball. The progressive and coverall jackpots are really exciting as well. The slots here are a blast and they have a really wide variety to choose from. In addition, they also offer scratch cards, table games and instants. They have a pretty decent welcome offer up for grabs here. Just for becoming a member, they set you up with £20 free when you make an initial deposit of £10. In addition to this, they also give you a free spin on the wheel for a chance at £2,500! As for the bingo here, they offer 75 and 90 ball. The jackpots are very nice and there are so many chances to win big! I really enjoy playing inside their ace bingo room. It’s a unique and exciting experience in which you need to play at a fast and friendly pace for some serious cash prizes. The promotions here are really great! One of my favorites is the pay day promotion in which they give away a monthly £1,000 guaranteed jackpot. They also feature a Monday madness promotion which is where the 1 line and full house are switched! Haven't played a lot of sites with this particular software, so I was curious how they compare to some I know way better. The site sports a fresh and clean layout, without much graphics or ads, so the navigation is also very fast and intuitive. As I love to play on sites with No Deposit Bonus, I was happy to see that they offer something like that in Zingo, with a £20 just to sign up. I wasn't expecting to win some cash out of it (and I was right, but I did get close to the WR). Anyway, I did take a good look at the games and although they only have the classic 75 and 90 ball games available, I did have a great time just hunting for bonuses. Good idea to keep an eye on the specials page, since they have regular promotions there. One of the sites I keep bookmarked.